Our Personalized Wedding Guest Books are in a class of their own. Elegantly welcome your guests with a beautiful personalized leather wedding guest book from Powell Leather. Photo Guest Books are also available. We can custom craft your personalized guest book to compliment the theme of your wedding. Your guest book cover and pages may be personalized however you choose to create a truly one of a kind custom guest book. Your book may be crafted from your choice of leathers, and adorned with your wedding art upon the cover leather. We will work with you to develop a page layout to blend with your own wedding plan. Please contact us to disuss how we might craft a personalized leather wedding guest book to enhance your very special day. 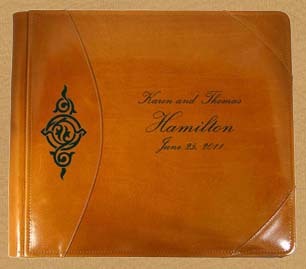 Your Personalized Wedding Guest Book may be crafted from the leathers of your choice. Fully personalized custom guest book page layouts are available. Easily integrate photo pages to create a photo guest book. Preserve the names and comments of up to 2500 guests.